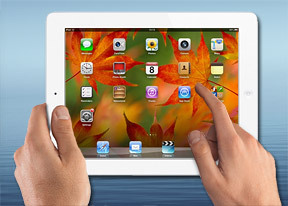 The iPad 4 comes in either Wi-Fi only or Wi-Fi + Cellular options. Wi-Fi is dual-band meaning both 2.4 GHz and 5 GHz bands work fine, covering all Wi-Fi standards - a/b/g/n. The cellular version of the iPad has two different flavors. There's a quad-band GSM/HSPA one with dual-band LTE and a CDMA version with quad-band GSM/HSPA and penta-band LTE. The cellular connectivity on the iPad 4 is used for data only, so native calls are out of the question. Also note that the Wi-Fi only version of the tablet does not have GPS connectivity, only the Wi-Fi + Cellular version does. This time, however, you also get support for GLONASS, which the iPad 3 lacked. The benefits of supporting two positioning systems are faster lock in dense urban regions and more accurate positioning in some areas of the world. There's stereo Bluetooth 4.0, nano-SIM support (for the cellular units) and the lightning connector, which corresponds to USB 2.0 with some MHL-like features. With the appropriate adaptor, you can get 1080p TV-Out or USB mass storage/SD card connectivity (which is very limited as you can only transfer photos and nothing else). Besides photo viewing, web browsing is the other area where the 4:3 aspect ration of the iPad 4 screen shines. Unlike widescreen tablets, holding the tablet in landscape gives you plenty of vertical room to work with and the Retina display keeps text sharp and readable even at low zoom levels. The multiple tabs support and the auto fill and password managers improve the usability of the Safari browser greatly. The pop-up menus appear as small windows on the screen itself rather than occupying the display things are even more desktop-like. You can share pages directly from the share menu in Safari. Sharing options include Mail, iMessage, Twitter and Facebook. Reading list allows you to save pages for offline reading. The Reader mode is a great way of reading longer articles in Safari. It strips the web content of fancy fonts and ads and presents you the essential stuff that's really easy on the eye. It works alright on most pages but you won't find it available as an option on all pages. For those cases there are always other options - like Evernote Clearly and the likes. The iPad 4 is noticeably better at browsing desktop sites than its mini sibling - the bigger and sharper screen allow you to read a page without zooming, while you have to zoom and pan on the mini. On the downside, it's heavier so you'll probably want to rest it on a table for extended reading. At 10 hours and 20 minutes, the iPad 4 is the new web browsing champ in our battery tests, beating the former champ, the iPhone 5. In this test the iPad 4 is ahead of the iPad mini too.